Pym has made 20 league starts so far this season, while Hamon, also 19, has been favoured for 11 league games. "It suits us having two fighting for it because neither of us comes off it (in training)," Pym told BBC Radio Devon. "Any goalkeeper would always want to be number one, but we are both young so our form is always going to dip." 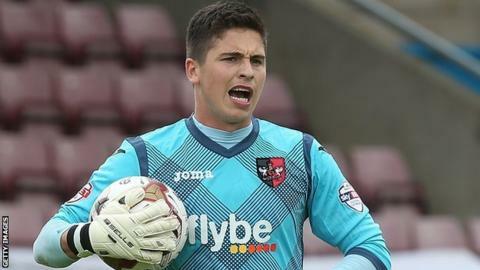 After appearing to have secured the starting role in the early part of the season, Pym did not play for the Grecians between 16 November and 24 January. However, he has been preferred again by manager Paul Tisdale for the last three matches. "James has done well when he's come in, so I can't really argue," Pym added. "He played well enough (for me) to bide my time and wait to get back in. "I want to play every game, so any game that I'm not playing is always going to be hard for me to take."